Philadelphia Printworks' "School of Thought" line. Philadelphia Printworks is a local clothing company known for melding DIY screen printing and design with a message of political empowerment and social justice. 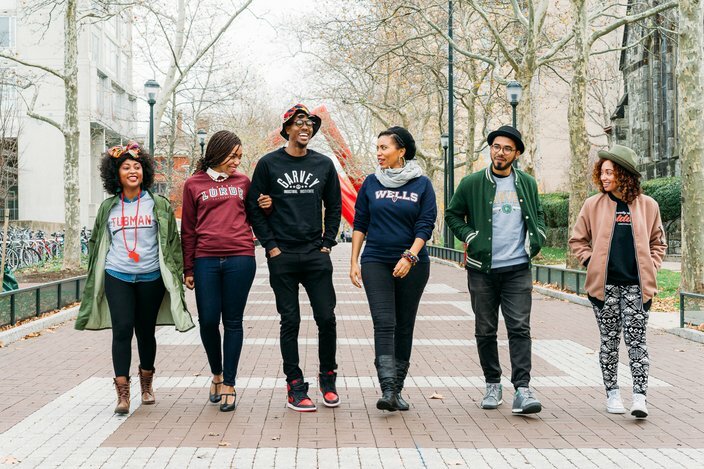 With its recent School of Thought line, which turns the names of overlooked black thinkers and freedom fighters into traditional collegiate-style sweatshirts, PPW imagines a world in which the contributions of a range of intellectuals and activists are represented and celebrated. Ahead of the Pennsylvania primaries, PhillyVoice sat down with PPW founder Maryam Pugh and artist Donte Neal to discuss politics, the 2016 election and the creative process behind School of Thought. PhillyVoice: Maryam, could you start off by giving a little insight into the history of Philadelphia Printworks as a company and its founding? Pugh: Sure. PPW was founded in 2010 by myself and Ruth Paloma Rivera-Perez. We started the company because we love DIY culture, we wanted to learn how to screen print, and we wanted to make a positive impact on our community. Over the years, our vision and strategy have developed. But, our main goal has been consistent: to encourage a culture of activism and inclusion. PV: Word. Did you originally start with T-shirts? The first pieces I recall seeing were the Basquiat and Move Bombing jawns. Pugh: We did. Those were some of the first pieces. We also had a fracking shirt and a few others. And [20th century black radical scholar/philosopher] Frantz Fanon. PV: I wanted to ask both of you to speak to the creative process behind the School of Thought line. 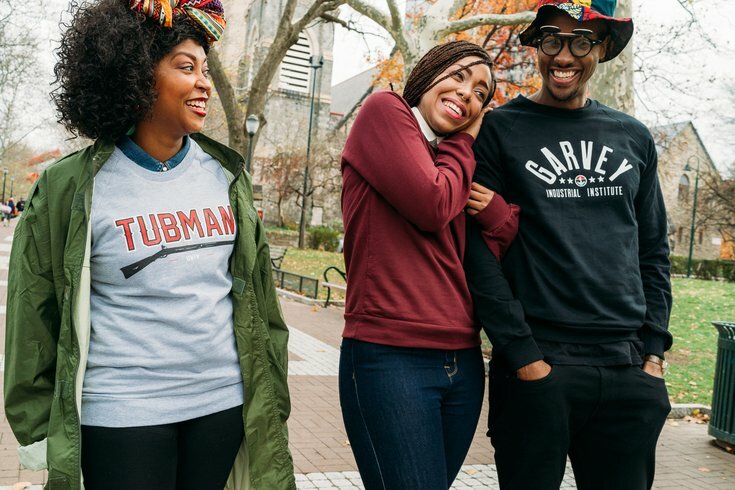 How did you come up with this idea of putting the names of historical black thinkers and activists on college sweaters? Neal: Me and Maryam had planned to work together when the time and concept were right. I brought the idea of the college sweaters into conversation early 2015. We both agreed the idea of universities named after people championed in the Black-American community was more than a fashion statement but a much-needed conversation about the American education system. The creative process was a shared effort of compiling the names of powerful black people, choosing the first six of those names for this collection and finally applying a collegiate design aesthetic. After a few critiques and tweaks, we launched School of Thought. Philadelphia Printworks' School of Thought line. PV: That’s incredible. 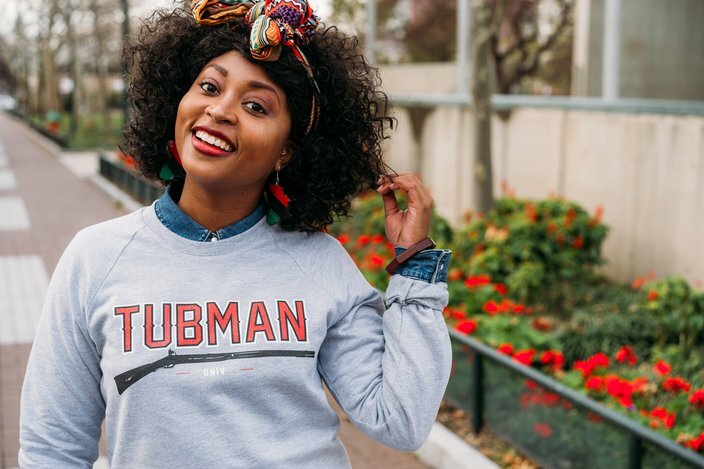 It’s funny because when I (and I assume a lot of people) first saw the sweaters, the social commentary seemed immediately recognizable: There’s something inherently powerful and subversive about elevating the names of radical black thinkers like Harriet Tubman, Audre Lorde and Marcus Garvey to the ranks of intellectual distinction that they totally deserve but are often denied. Pugh: Yes. Absolutely. I think that's exactly what we were going for. PV: How has the response to the line been? Neal: The reception has been overwhelmingly positive and enthusiastic. I think when people feel misrepresented or not represented at all in their environment they're excited when they see something in the world they can directly relate to. Especially when they feel like no one else understands them and their stances in society. Pugh: It's been amazing. People responded immediately. It was overwhelming, surreal and almost surprising. Not because it wasn't a great idea. But, we were kind of just minding our own business, doing what we do ... and it resonated so broadly and widely. I think that's a testament to Donte's great concept and execution. PV: Absolutely. I wanted to talk a bit about the political perspective that informs PPW’s work. I’ve noticed that PPW’s Instagram and Facebook pages share a lot of articles and content that are thoroughly political. With the company’s recent success and increased visibility, is there pressure to play it safer politically? Pugh: There is. But, I actively identify that pressure and choose to ignore it. Currently, I am still the main social media contributor for PPW. Depending on the platform, I do find myself pausing to reflect before posting certain things because I know that the posting may be political or controversial or an unpopular opinion. Ten times out of 10 I post it anyway. Recently, I lost 10 followers because I posted a retweet about transphobia. But, I also gained 10 followers. Our mission is to encourage a culture of activism and inclusion. If I begin to deviate from that mission, I am no longer satisfying my objective. Philadelphia Printworks' School of Thought Harriet Tubman Collegiate Crew. PV: No doubt. I wanted to ask, have either of you been following the election? I remember a previous PPW line that featured a really dope Shirley Chisholm for President sweatshirt. Has anyone from the [Hillary] Clinton campaign contacted y'all about creating some PPW 'Vote Hillary' jawns? Pugh: HA! No, no one from Hillary’s camp has contacted us. We’ve both definitely been following the election. I’m a Bernie supporter. PV: Can I ask you both for some final thoughts? Could you give us a bit of perspective on the future of PPW? New lines? Ambitions for the brand? Pugh: Philadelphia Printworks is currently working on a few new collections for the spring/summer. That includes a follow-up to the School of Thought collection that will include T-shirts and hats. We're also working on a kids line with [author] Eryn Amel, and we plan to expand through a partnership with Latina Rebels. Neal: My hope is that this collection creates a sense of community based on the “alumni” of these intangible universities. That the legacy of the people we chose to spotlight in this collection work as the syllabus for the students of their school of thought.